Graphic 45 steampunk Debutante..not a card..
Not a card today! 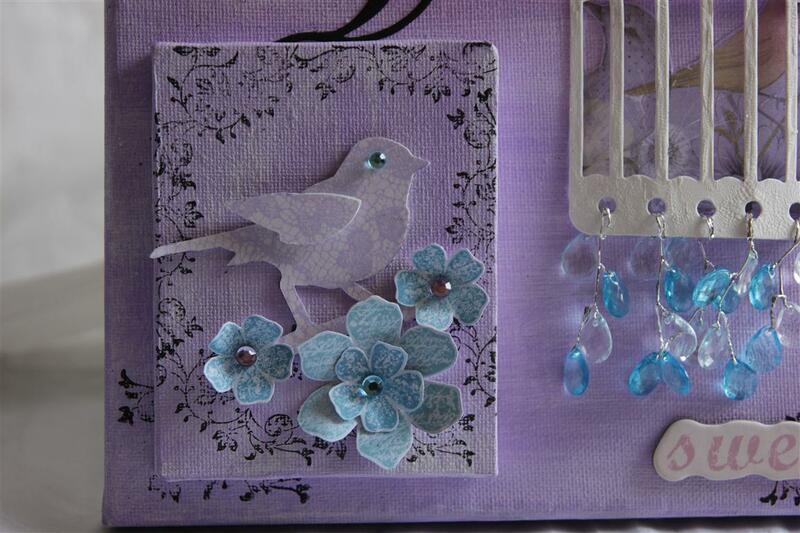 Instead I thought I would show you what I made over the Easter break. I have had the printers tray for about a year now, and always knew what I wanted to do with it, and finally sat down and just did it! 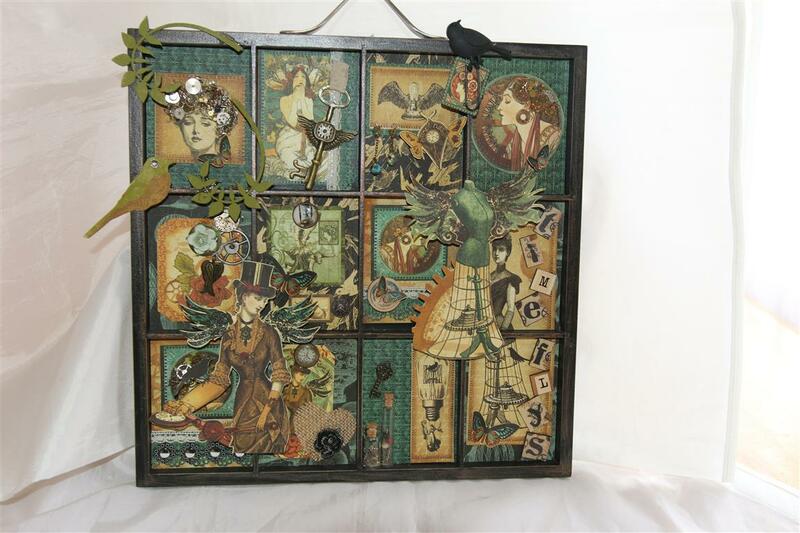 So co-incidental that Marcelle commented on my last post about time flying because that is the theme for this one!I used Graphic 45 Steampunk Debutante paper collection, and added lots of recycled bits and pieces such as buttons, hessian, watch parts, beaded jewellery, and Prima letter tiles and canvas bird, twiddleybitz leaf flourishes,tim holtz glass bottles and lots of other bits as well.I aged the tray a bit by lightly brushing with gold viva paint.Today is an exciting day in my blog history as well, as sometime in the next few hours someone is going to be my 200,000th visitor.Amazing! Thank you all for sticking with me – I know a lot of you have been with me from the beginning( way back in 2010)and we’ve come a long way since then! Til tomorrow….. I am going to be MIA for the next few days – My sister and I are leaving all the males we are surrounded by in our families and going on a girly road trip down the coast to Robe. We are looking forward to a lovely relaxing time of good food, lots of fresh sea air to blow the winter cobwebs away and hopefully a little sunshine! So today I have posted a canvas art I made instead of the usual card. I painted my canvas black and added a few strokes of white to vary the background a little. I had left a little patch without paint which I sprayed with Dylusions spray in yellow. 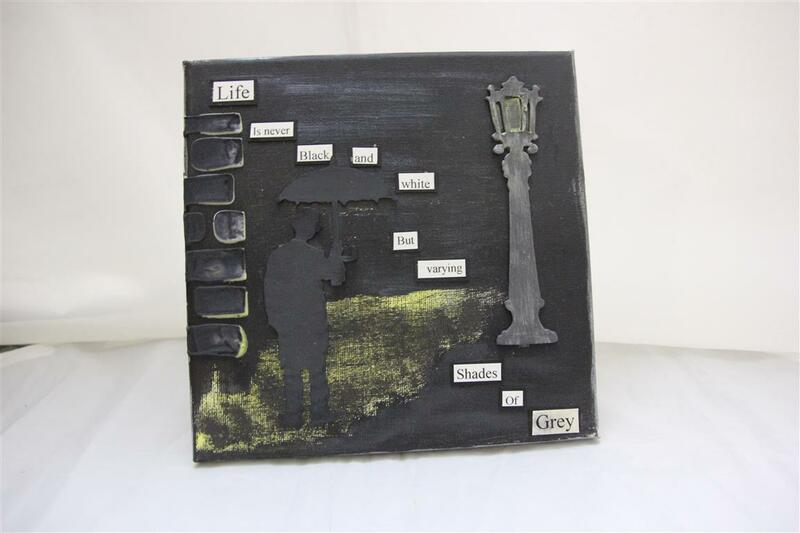 I die cut some thick chipboard using my Tim Holtz sizzix umbrella man and lamp post, painted black and then swiped a little more white. I used a stencil for the brick wall, and some texture paste and once again painted roughly black. 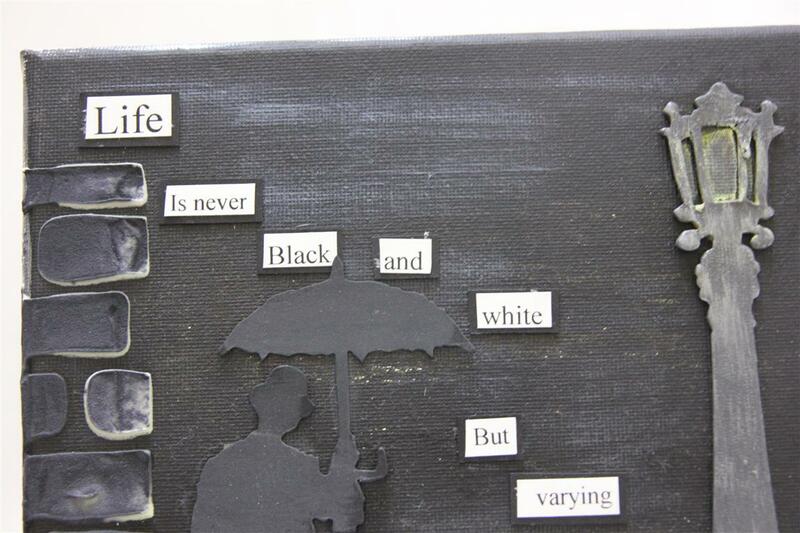 I typed the sentiment on the compter, and matted each word with black cardstock. Something completely different for me – not a ribbon or bling in sight but I always knew I was going to do something a little different with my umbrella man – I love him! Til Monday, keep safe…..
Not a card today! A short while ago it was Mums birthday, and as she is crazy for roosters I made this plaque to put in with her present. The base is a large block of wood – my sister is swapping all her wood mounted stamps over to unmounted for ease of storage and she will then use them with acrylic blocks, she has a lot of stamps and I asked her to give me all the wood off cuts as I can think of lots of things to do with them – anyway this is where the wood came from – it once was the base for a large background stamp. 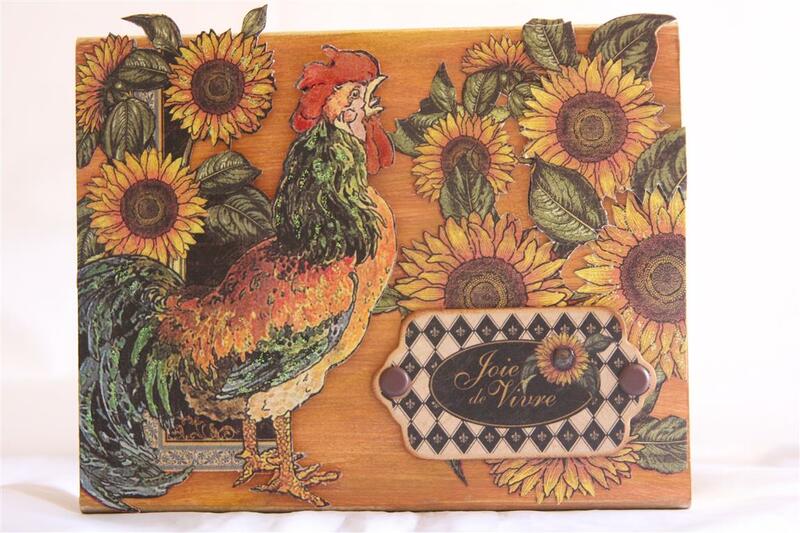 I painted it with Viva metallic gold paint around the edges, and the rest with Vintage photo distress paint ( great stuff) and then covered it with images I had fussy cut from Graphic 45 French Country papers. I haven’t made a card with this paper yet but hopefully will get time this weekend to pull it out and have a play! I added a chipboard piece in the corner.Til tomorrow…. 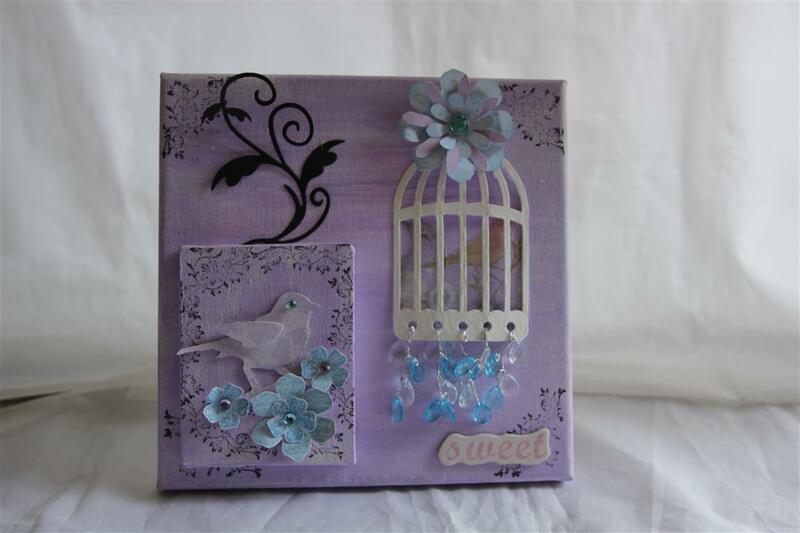 Every now and again an idea is too big for a card,and so it was with this one, so i moved it onto canvas.I painted the canvas with acrylic paint, added some stamping in black stazon,and then started decorating! The flourish is a cheery lyn die – tropical flourish, bird and cage is sizzix tim holt caged bird, and the flowers up the top are die cut with sizzix stampin up Blossom party die, and down the bottom stamped using stampin up vintage vogue stamps and then fussy cut and assembled.I attached a small canvas onto the bigger canvas, and the bling at the bottom of the cage is Magnolia chandelier garland.The small ammount of paper I used is Prima Meadow lark.I am still amongst xmas cards, but see light at the end of the tunnel, and hope tomorrow to move on! Til tomorrow…. As a bit of a break from cards ( just for today) i thought I would show you all something I have been experimenting with – Canvas Art.I have a few stamps that are shown off to better advantage when used in a scene like this, and it’s been in my mind for a while to try something like this. 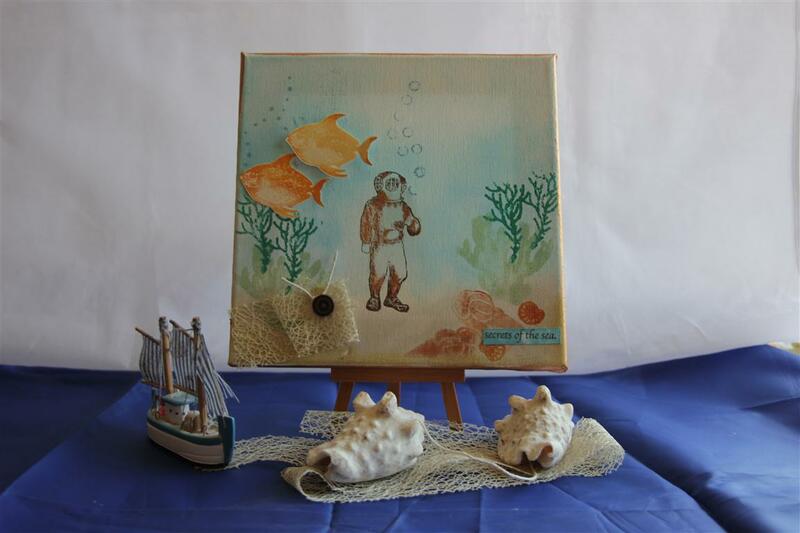 I used tim holtz ranger distress inks to colour the canvas background,and then stamped directly onto the canvas with some stamps from Oxford Impressions In the Deep. I stamped and coloured the fish seperately onto cardstock and stuck them onto the canvas, and added some netting, string and a brad for some added texture. I edged the canvas with Viva metallic paint in Gold.Hope you like my little diversion – back to cards tomorrow! Til tomorrow….